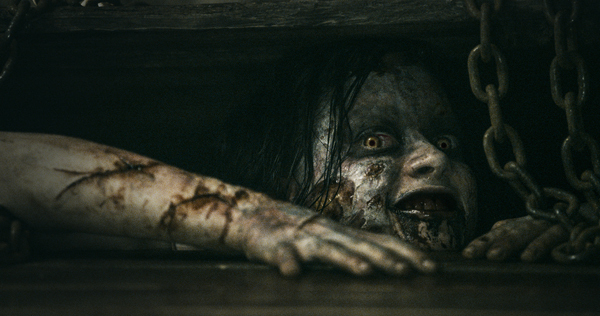 When I heard that they were remaking EVIL DEAD I was nothing but against it. I thought the original was grand. We watched it over and over again "back in the day" and it was untouchable. As I've been diving into the genre more and more and have been trying to look at films as solitary works and not part of a family unit or holy, untouchable art, I'm starting to see the value add of the remake in our society. CARRIE is being remade as well and that has always been looked at as one of the golden, untouchable films in the horror genre, yet there really is something to be said for remaking it and taking modern times, religious beliefs and modern teens into consideration. Rob Zombie's HALLOWEEN remake was shunned by me until I looked at it with a stand alone vision and it's really not a bad film as slashers go. Zombie did a fine job with things. Which brings s to the EVIL DEAD. Shot on a shoestring and crafted by people who loved the genre, EVIL DEAD is a great film with fantastic, unfinished edges and a rough and ready feel to it. The cabin in the woods sub-genre was turned on it's ear and dragged through the woods along with Bruce Campbell and we all loved it. But, a modern retelling of the films sweet storyline with some more money behind it and a few modern effects might be all sorts of awesome. And, from what I saw in the trailer, I'll be there opening weekend for sure.